Hi, Sue Fliess! Thank you for celebrating Mary Had a Little Lab’s book trailer with me. I love that you have created book trailers for most of your books. What do you love/appreciate about book trailers? Sue: I’m a huge movie trailer fan...For better or worse, I will often base my decision to see a movie on the trailer. Sometimes you can tell when the movie has used all its good jokes in the trailer, or if they don’t show you much at all, they are likely trying too hard to sell it. So I think it’s important in a book trailer to be honest—to show readers what they’ll be getting when they buy my book. I try to leave just enough suspense to not give away the ending, but still let the audience get a true glimpse of what they are going to experience with the book. Also, they are fun to make and it’s a great marketing tool! 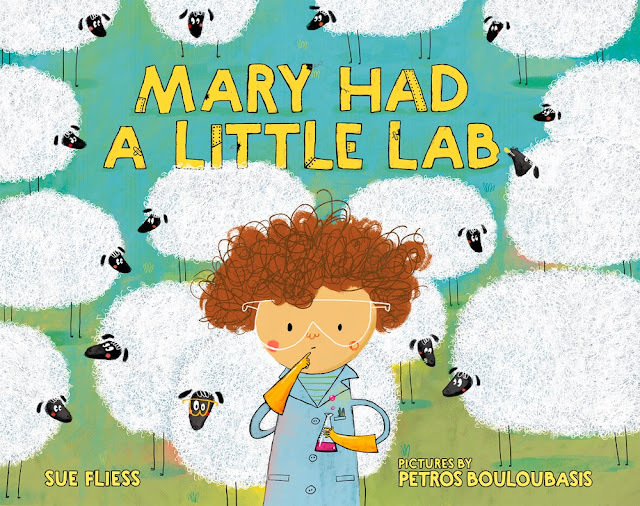 Sue: The Sheepinator is Mary’s “best invention ever!” Mary is a little bit lonely, as she spends most of her time in her backyard lab rather than out socializing with other kids, so she decides that having a pet will ease her loneliness. But since she’s a scientist and inventor, she decides she’d rather make one than buy one. From the book’s title and the machine name Sheepinator, you can probably guess what kind of pet she creates. Petros Bouloubasis’ illustrations are lovely. What’s your favorite spread or scene? Sue: Do I have to choose just one? I have at least six favorites! “The new machine is finished! And gently pulled the lever. I love this because it shows her tinkering with the machine, putting the last touches on, the other kids looking in the window, curious as to what she’s doing. Then we see Mary propped up against the machine pulling the lever with all her might, sweat flying from her brow, grimacing, which proves a funny paradox to the text. I also love that the machine looks pieced together, and is balanced on a random table leg, a stack of books, and other household items. Petros’s illustrations are so clever...like Mary! Please share three adjectives that best describe Mary. On March 1, 2018, Mary Had a Little Lab can be yours! It’s my first STEM-related book, mixing science, chemistry, inventing, humor, friendship and the idea of being yourself. I’m super excited to share it! The book also shows that trial and error is a-okay. So many kids now are terrified to fail. Did you know that Thomas Edison apparently made 1,000 unsuccessful attempts at inventing the light bulb? But he didn’t call them failures, he said “I didn’t fail. The light bulb was an invention with 1,000 steps.” I love that. To piggyback that thought, this book took many drafts to get right! Mr. Schu, you should have asked me if I have a pet. I do! Thanks for asking. I have an English Labrador Retriever named Charlie. In fact, this book title came to me in a dream, and I’m pretty sure in my dream, I was referring to a dog. But when I realized lab could be laboratory, the story took off. That said, Charlie is not nearly as helpful as Mary’s sheep. Mary’s sheep assists with chores like carrying the groceries and buffing the floors, while Charlie’s biggest accomplishment each day is snuggling all of us, finding the best spot on the couch for a nap, or the best stick to carry on our walks. But that’s okay, we adore him, and he, like Mary’s sheep, helps me make friends wherever I go. Look for Mary Had a Little Lab on March 1, 2018.